“Fair Share” follows a failed pet store employee named Dan Downey. If being cruel to your characters is the key to success, Steven Lane Smith is in for a great career as a writer and readers are in store for a fun read. Dan fails at everything he does until he meets his “mentor,” so to speak. Fast-talking Codwell Gutterman is a high-speed conman. With Codwell's help, Dan finally finds some minor success by pretending to be a mentally challenged little brother to Codwell. If you're sensitive to things like this, then this book is not for you. Dan has a hard life on all fronts. He has basically retreated into the life of the fictional character whose book he is working on. By the way, this book Dan is working on has no chance of succeeding. Dan and Codwell are trying to find Dan's father or at least that is what Dan believes but then again, it's Dan and he does not have a clue. “Fair Share” is an over-the-top dark comedy that does not take itself too seriously, and as such, makes some of the painfully funny things Dan goes through more believable, and some of his lack of logic more legitimate. However, it is still kind of out there. 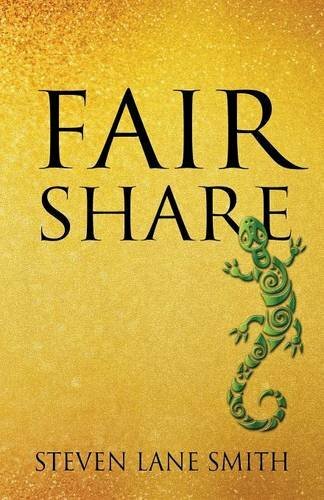 “Fair Share” is a solid read that will appeal primarily to those who have a dark sense of humor and don't mind a less serious read. It is fun, fast, and decently written. At face value, it is just entertaining and occasionally shocking. I do think I might check out some of Steve's other titles. I really like his writing style and sense of humor, although I personally found Dan pretending to be mentally disabled somewhat offensive. Overall, Fair Share is a good read; it is the kind of book you pick up for pure entertainment value, when you need something to read at the beach or in a cabin somewhere. It is not the kind of book that is going to lead to meaningful conversation or intellectual engagement, which makes it no less entertaining. It just is what it is and I am fine with that, as is the book. "Fair Share" by Steven Lane Smith is a fast, fun, often funny, occasionally dark, and always entertaining read.